Many people love to paint their homes on their own despite several affordable painters are available in their area. No matter how much time it takes, but still they enjoy using their creativity in painting and decorating. When we talk about the most valuable asset of any home that awesomely in enhances the overall appeal of a house, furniture steals the first position. So, how can one keep his furniture looking dull, old and untidy? Now, painting furniture at home can make more comfortable and more affordable with the help of the paint sprayer for furniture. You can find plenty of furniture paint sprayers that you can use with great ease and comfort. Whether you want to paint cabinets, lawn furniture, tables or any interior furniture, these paint sprayers give fantastic results and an incredibly new look to your old furniture. Besides, they are helpful in accomplishing small and large paint jobs with great perfection. Such types of painting devices for furniture are less time-consuming and offer a better outcome than painting with brushes or rollers. Even, people without any experience on using furniture paint sprayer find it easy-to-use and a hassle-free painting device. Choosing the best and right paint sprayer for finishing furniture can be a tedious task for many people who do not know anything about painting devices. Let’s have a look at few furniture paint sprayers that got a high rating from their users due to their high-quality and efficient results. This sprayer has a two-stage turbine that makes it a suitable choice for furniture painting and staining projects. Also, it is highly capable of handling thick material like latex as well as lacquers and stains. It can control air pressure, thus it never overspray even with thin materials. Also, this spray offers three different spray patterns that can be flexible on your project to bring outcome beyond the expectations. Its adjustable spray nozzle allows you to spray more precise using horizontal, vertical and round spray patterns. It has a 20 feet air hose for easy spraying and gives a more uniform surface to the furniture. The quick start guide will help you how to set pressure, airflow, and volume, etc. correctly. This furniture paint sprayer is ideal for 4-8 quart furniture paint projects. It can be used to spray latex paints, oil-based paints, acrylics, enamels, and solid stains. Thus, you do not need to make the material thin as it gives professional quality finish without making any change. It has tilt-n-spray pendulum suction tube that allows the sprayer to move and spray from all directions, i.e., up, down and sideways without affecting its finishing quality, volume and speed. This paint sprayer for finishing a furniture is easy to repair. Thus, it gives you long years of companionship. It comes with 515 True Coat Reversible tips, a container with cover, five liners, startup tool, and storage case. The instructional DVD helps to learn its best use and settings. 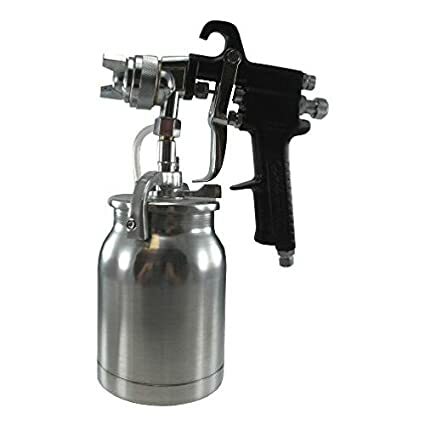 This paint sprayer has a compressor mounted metal spray gun and a Mason jar that can be filled with different materials. It includes paint, stain, lacquer, etc. The lid and cap of the 16-Ounce Mason jar are the same with other ordinary jars which have the same size so you can use other jars whenever the need arises. Moreover, the sprayer comes with a tube, jar gasket, and an instruction manual. Such type of sprayer is ideal for beginners who want to give a professional finish to their furniture. It is comfortable to use and clean. Such sprayer with small spray gun can be used for small and medium projects without any hassle of adjusting to the big guns and wasting too much time. This Campbell Hausfeld siphon-feed spray gun (DH650001AV) can be used for lacquer, enamel, stain, primer, and urethane. It’s a quite flexible spray for many painting demands. This non-bleeding spray gun delivers an adjustable pattern of up to 9 inches with Siphon-feed. Also, it requires an air compressor that can provide a minimum of 7.0 SCFM at 40 PSI. Moreover, the anti-drip canister helps to minimize the cleanup procedure. It is not compatible with the HV2500 but recommended to use with the MP331100AJ. Campbell Hausfeld siphon-feed spray gun is highly ideal for the beginners with various demands. Also, it’s perfect for customizing and restoring automobiles, trucks, and motorcycles. HomeRight C800766 Finish Max Fine Finish Sprayer gives you a modern finish on any surface; it’s a perfect tool to have for any DIY projects. Moreover, this sprayer can be easily used for repurposing, refinishing, repainting, restyling, upcycling, renewing, revamping and refreshing second-hand furniture or cabinets. Especially, the Finish Max comes with three different spray patterns for more projects and can hold 27 ounces of paint. The unit is light. It weighed 2.76 lbs only which includes Finish Max, air nozzle, cleaning brush, and viscosity cup. Just add any paint, stain or varnish such as chalk-type paints, cabinet paints, furniture paints, stain, poly, and latex but get a quality finish with minimal overspray. It’s easy to set up, easy to use and easy to clean-up. It is backed by a two-year warranty. With HomeRight C800766 Finish, no more color limitations. Just let your color into the house. Rightly chosen furniture paint sprayer helps to complete different painting projects within a few minutes. Many of these sprayers available in the market are helpful in painting your home walls. They are highly portable and take tiny storage space. You get rid of the hassle, uneasiness, and mistakes of using brushes for furniture painting jobs. You have plenty of options to choose from; this helps you to buy one that best fits your needs, budget, and skills. This article will help you to become familiar with furniture paint sprayer as the best tool to paint your furniture. When paint sprayers for furniture are used in a proper manner, it gives a smooth and exquisite finish that makes a painter proud of his/her efforts whenever he/she sees that painted furniture. Just get the best paint sprayer for your next furniture painting job.